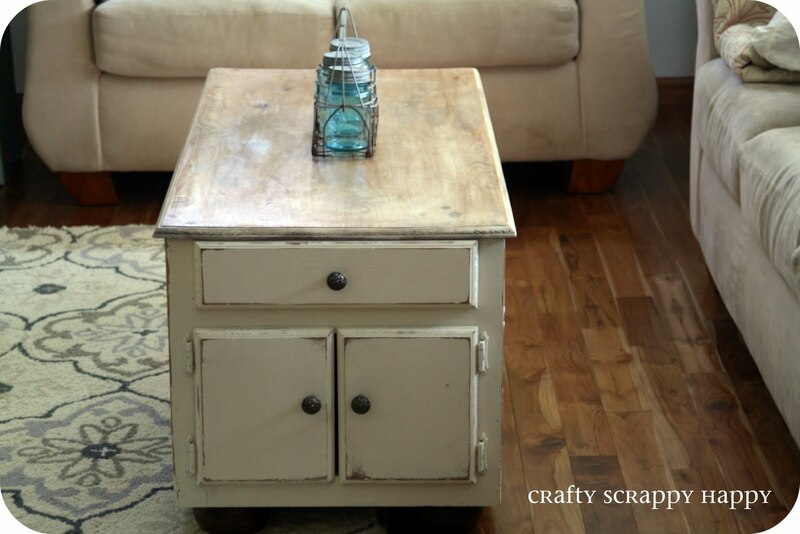 Crafty, Scrappy, Happy: Coffee table --- from the take it or leave it bunch! 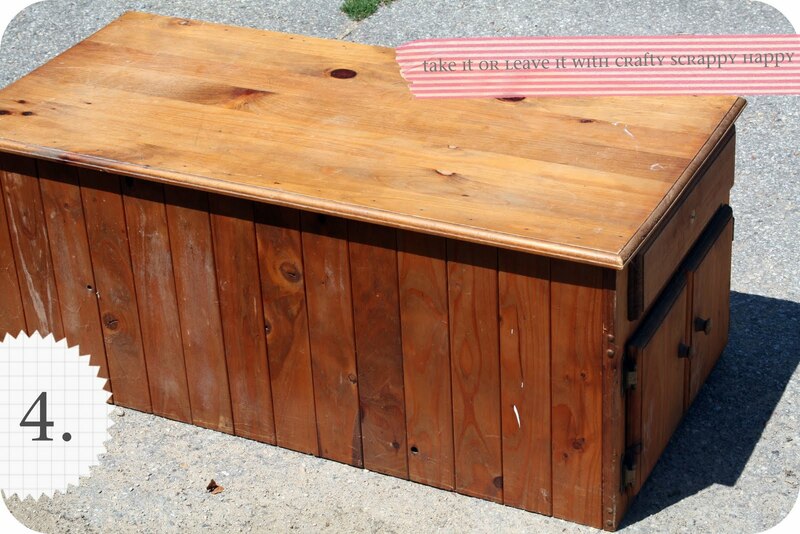 Coffee table --- from the take it or leave it bunch! Remember my take it or leave it post from last week?!? Well I had such a blast hearing what you had to say about my finds. I loved hear what you would do with the pieces. And now I am excited to start showing you what I did! Here is my first of the four pieces. This was my favorite from that day of garage sales, and so that is why this one is finished first. This guy was SOLID heavy and well built, which is exactly what I look for when I want a project! I think it fits right in with everything else in my house. Nice and beach-y and sweet. Just some old white chalk paint, distressing, new knobs, and stain. I found the knobs on sale for half off at Hobby Lobby. I think they were just right for this guy. The stain that I used was darker, but I used a lot of it in little layers to get it just right for what I was wishing for. 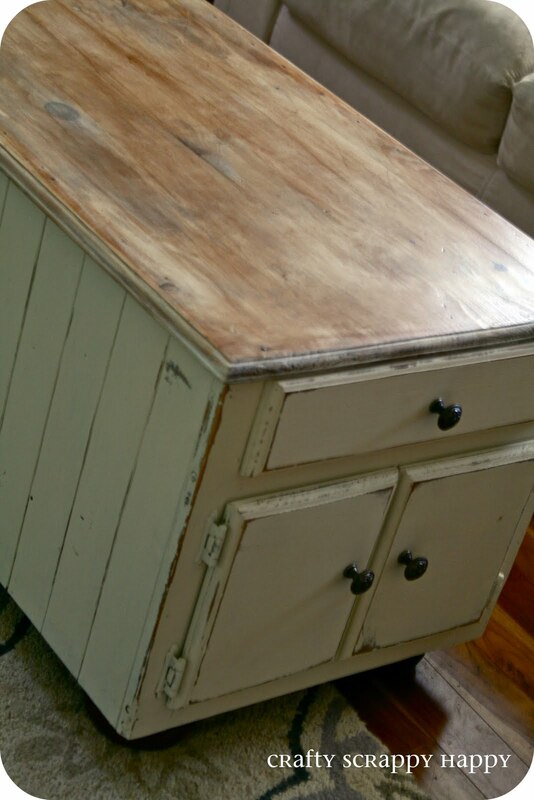 I did white wash the sides a bit because I wanted there to be a nice flow from the white to the wood top. And did you notice that this guy got a little taller? I just felt like it was a bit heavy before the legs were added. Is this what you pictured for those of you who said you would have kept this piece? Did you like the take it or leave it idea? Becauseeee I have some new finds that I would love to get your opinion on! I am linking up at a few of these parties this week. Jaime - that's amazing - I have to admit I might have left that one behind but you demonstrate how vision comes into play. Fabulous job! Love it. Why can't I find stuff like that. I need to find something to use as a tv stand in between two bookcase. It also has to be like 54 inches wide. Anyways, great job!!!!! holy crapoly wow! Jaime Lyn you are amazing. I LOVE this!!!!! Really, I had him on my take list... but I never would have been able to make it look as good as you did! Great job! I love it! Jamie Lyn I think it's wonderful! Beautiful color and very unusual table! Love it! It's gorgeous! 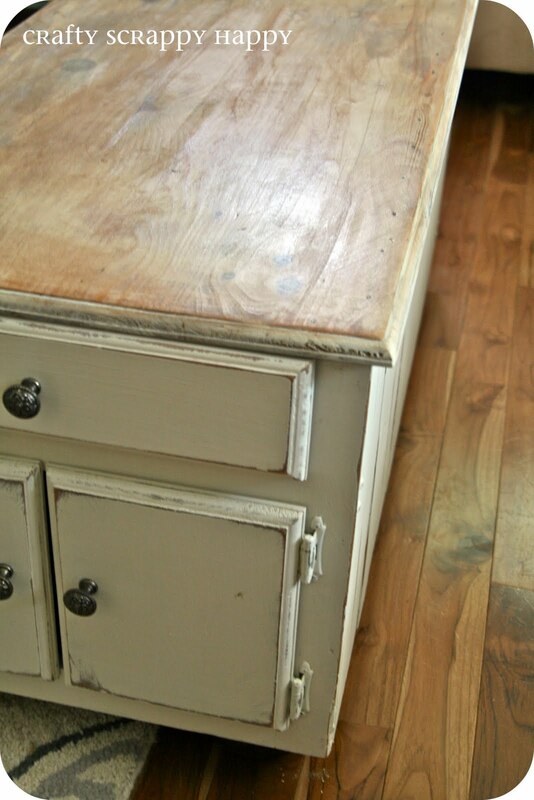 I'd love to know how you refinished the top. I kind of always get nervous to redo table tops, any tips? OK, Jaime...gotta tell ya...this was the piece I was least sure about...but when I saw the first "after" photo, I said (out loud, mind you) - OH! It's perfect! I can't believe it's the same piece...is just so lovely...you have a wonderful way of seeing how a piece should look and then executing that perfectly...Jaime, you truly rock. Great job. I just love this! I used the same technique on a magazine rack I got last week. It's so simple but the results are so satisfying! Beautiful! love love LOVE it! Oh my goodness...you took from $5 and turned it into a million bucks! I really want to know what kind of stain you used. 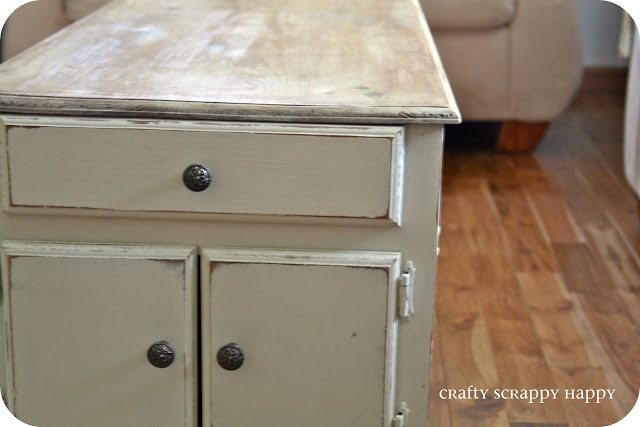 I am painting a cousin's toy box and I think this whitewashed look would be perfect!! Wow! It looks fantastic. You have such a great eye for what can be done. I said leave it on that one, bu now I would definitely take it! Loved that you raised it. this rocks! it was not first on my list to take - but wow! Great job - amazing. can't wait to see the rest!!! LOVE it! and love that you added height to it! Wow! I'm speechless...... LOVE IT! Well, well I am glad you listened to your own heart and kept this little guy! It looks splendid. Fits in with the room perfectly. What a transformation! You did an amazing job!! It's fantastic and I adore it! You did an awesome job..wow. I would have for sure left that piece behind, but I'm glad YOU didnt!! Oh my goodness! I totally would have passed it by before...it's just beautiful now!! WOW! I'm so impressed! I totally want to do something like this! Okay....it's a keeper...hehehe I just didn't have the vision for it that you did (I think I said I would have left it) It looks amazing and fits in perfectly! I don't even know where to start. I know I have been a bad friend..(I will call you back this afternoon). We have not only not spoken in a while but I have also been neglectful with the blog stuff, yours and mine both. Knowing you post nearly everyday..I really shouldn't get behind. I don't know which project to comment on!! Im completely overwhelmed.You have done some wonderful things lately. 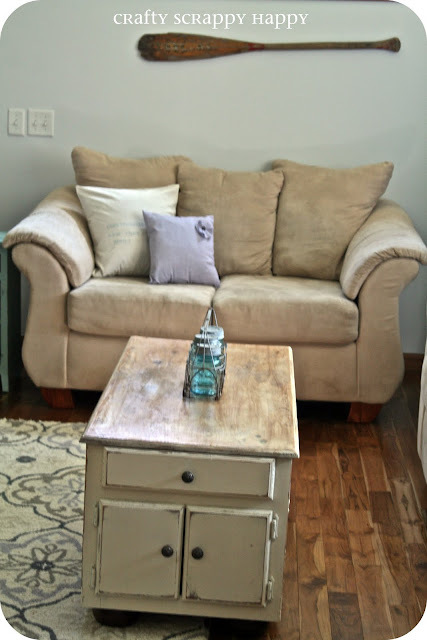 This coffee table makeover find is my favorite but I really like the piano bench makeover too! You even changed the look of the blog again. Great:) Your giving wonderful distressing tips! I can't wait. 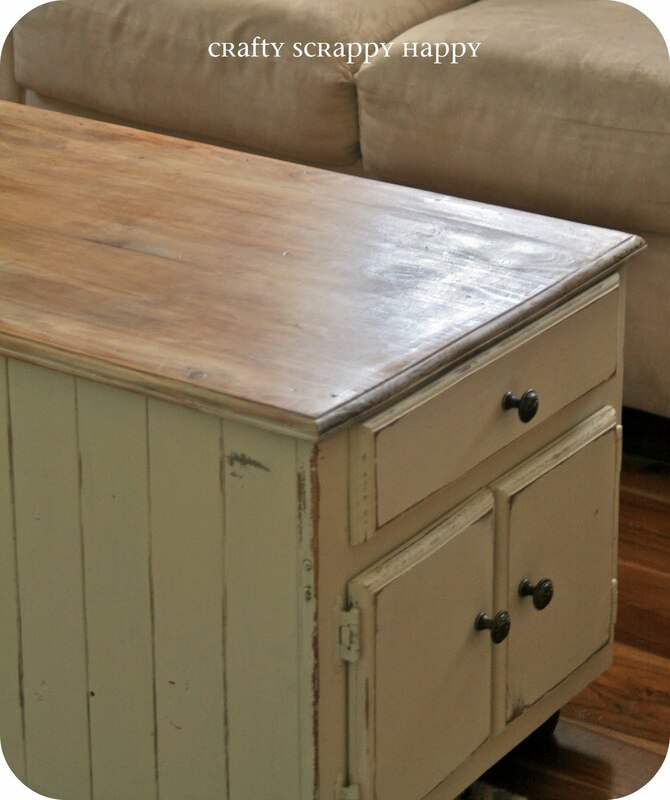 Nick and I have purchased a few new pieces of furniture and we are painting and distressing the old stuff white. YEAH!! I need your help. Your going to have to show me your painting supplies next week. If you get this comment before I get to talk to you...road trip here we come. We are for sure coming. We are super excited. It's funny actually. You two probably spent so much time on the road that a road trip is dreadful. We are actually excited about everything right down to the drive:). Oh my we are dorky. This is totally amazing and I am so jealous. I am not adept at the whole distress thing. I either over-do it or don't distress enough. So glad you shared. I love it! Thanks for sharing at the DIY Showoff. I have to admit I'm not sure I would have picked it up, and that is saying something. That is an AMAZING redo! I never would have guessed it was the same piece! I love the beachy look. You did an amazing job! LOVE LOVE LOVE it!! Gorgeous! I love that you put the legs on it - the height gives it a totally different look. Beautiful! My version of a printable. Have you ever considered bench seating??? Did I mention I like to make jewelry too? 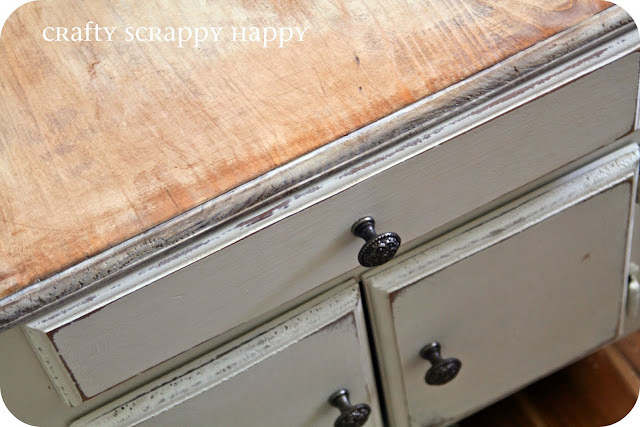 A giveaway with Literally Inspired-the shop! Have you met Duck Egg Blue?